Coditex now sells the whole range of Perancea Potting Boxes and encapsulation shelves. Perancea launches the Ritec range of electronic Hand-held & small enclosure range from Hammond and it perfectly complements the Perancea range of cases and enclosures. 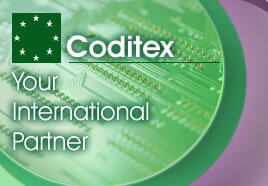 Procurement of Electronic components and equipment Coditex will do the rest as your International Partner! Coditex Electronics Ltd specialises in purchasing electronic components and equipment for small and large corporations all over Europe. © 2004 Coditex Electronics Ltd.